CO: This House Is Mine gave me everything I had wanted in the last few plays I’ve seen–a frank and caring portrayal of difficult issues, and a portrayal which strived to be for the people it was about. I would call it the most important piece of theatre I have seen in a long time. EM: The production’s overall triumph is in its authenticity – the ensemble of performers and artists were all people who had personally experienced homelessness. I overheard many attendees afterwards who were amazed at how sensitively the show handled its subject matter. Given the people who were involved in the ensemble especially, there would have been no other way the show could have manifested. Unsurprisingly, then, the performances of the ensemble cast are outstanding. Very moving. This House is Mine was at once a powerful piece of social commentary/activism and an immaculate piece of artistry. While it effectively communicated its non-fictional message, it never stopped being theatre. CO: And its theatrical value should be acknowledged. The show’s message and authenticity of expression are its focal point and its strength, and each aesthetic choice made not only aligns with but further emphasises its themes: at every moment, the whole stage is an carefully constructed externalisation of some experience with mental health.The show is set against a white backdrop, upon which an impressive series of graphic sequences is played–a patchwork of emotions and mental states, heightening each moment’s impact as well as serving as synthesis of medium and message. This House Is Mine tells stories of a multitude of experiences with mental health, constantly reiterating that, whilst no mind is the same, each one has a sole owner, each a rich and full home. EM: The design elements of the production especially emphasised that message. The projections of artwork are skilfully utilised, and do nothing to distract or dilute the performances by the cast. The combination of a simple physical set and projections allowed for moments of minimalism or emptiness, and then equal moments of incredible intensity. Retired psychiatrist and now Alzheimer’s sufferer Frank’s (John McDonnell) hallucinations of the faces of his past patients are sketched live onto projection surfaces, which are then physically manipulated by the cast to great effect. Perhaps most notably, Contessa Treffone’s moving performance as a schizophrenic girl suffering a psychotic episode is eventually complemented by projected images, sound design, and painfully simple lighting that vividly exposes what psychosis is like for the sufferer. One audience goer declared afterwards that despite years of trying to describe their own episodes to doctors, the sequence was the first time they had felt their experiences even close to being understood. CO: What makes This House Is Mine’s portrayal of mental health so unique, what makes it so vital, is the importance it places on healing. 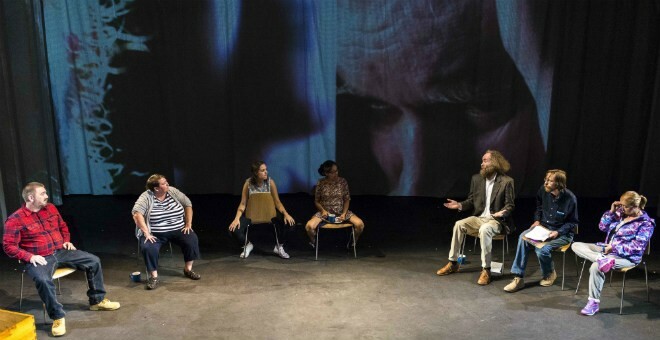 The show’s third section, entitled “After”, strips back some of its larger-than-life symbolism and depicts a group therapy session, conversations between parent and child, humans taking control of their lives, humans moving on. The piece’s peak moment, for me, was video footage of interview subjects describing themselves as “survivors”, saying with pride “I am still here”. With a piece that delves so fearlessly into the grim landscape of healthcare and support for those without homes in this country, this victory is essential, and hugely gratifying. EM: And the focus on healing was so clear outside of the show’s narrative arc, too, for the benefit of those both onstage and in the audience. The show’s graphic portrayal of Mack’s domestic abuse of his wife Clem was devastating, and terrified me and most audience members to tears – but the symbolism of Chris Barwick, firmly out of character, helping Fabiola Meza to her feet once the scene had ended was immediately palpable: this is just pretend. This is, before all else, a safe space. We are working through these traumas together. CO: Whilst very confronting and upsetting, it feels incorrect to call this piece traumatic. The show opened with a gutting and realistic representation of a conversation I have had a number of times–a frantic plea for someone not to harm themself, to take their own life. But even as the show deals with the traumatic reality of domestic abuse, or homelessness, or depression, or dementia, it does so throughout with an exceptional care and perception for authenticity. Nothing is a spectacle here–in every moment the creators are saying “this is a reality”. EM: The audience feedback session at the end underscored the final image of the production, which was that people with mental illness or who have experienced homelessness live among us, and affect people of all stripes. The folks from Milk Crate Theatre expressed a desire to do the show again; they absolutely should. And you need to see it.